Washington destroyed Washington State’s chances at making the playoffs in a snowy Apple Cup and looks to continue their winning ways against a surprising Utah team. Washington beat Utah 21-7 in the regular season and I don’t expect that to change. Both defenses are elite, but the Huskies’ offense is slightly better. This will be a close one, but Washington will edge this one out. Washington’s defense looks very impressive right now. Last week they held Washington State, who averages 38.2 points per game, to 15 points. The Huskies have enough fire power on offense to outlast Utah’s defense. I expect Washington to win a close game here. Oklahoma has one of the worst defenses in college football, but their dynamic offense makes up for that. This game will look alot like Oklahoma’s 59-56 win over West Virginia, but this time it will be the other way around. Texas is Oklahoma’s only loss, defeating the Sooners 48-45 during the regular season, and they’ll make it 2-0 against them this weekend. Texas wins in a Big 12 shootout. Oklahoma has one of the worst defenses in the country; however, their offense is spectacular. The Sooners haven’t scored less than 48 points in their last six games. Texas is 104th in the country in passing yards allowed per game and I don’t see them containing Oklahoma quarterback, Kyler Murray. The Sooners did a good job forcing a few turnovers against West Virginia, and if they can force The Longhorns to cough up the ball, they can win the Big 12 championship. I’m putting my faith in Kyler Murray to win this game. Unfortunately for the Golden Knights, they lost star quarterback McKenzie Milton to a gruesome knee injury last week against USF. They still managed to handily beat the Bulls 38-10, but will have a hard time against a Memphis team that they only beat by one point in the regular season. The Tigers have won their last 4 games and star running back Darrell Henderson and quarterback Brady White have been phenomenal. Don’t be surprised if Memphis beats UCF handily. Boise State is 5-1 on the blue turf and beat Fresno State 24-17 a few weeks ago. Both offenses are dynamic and Fresno’s defense is better, but I don’t see the Bulldogs getting it done on the road. Broncos’ quarterback Brett Rypien should have a good game as Boise State wins their 3rd MWC Championship in 5 years. Boise State already beat Fresno State in week 10, 24 – 17. The Broncos continue to look impressive on offense and I expect this game to have a good amount of scoring. If Boise State running back Alexander Mattison can play well like he did in their last matchup (143 rushing yards and 2 touchdowns), the Broncos will win the game. The Buckeyes shocked the nation last week with their 62-39 win over 4th ranked Michigan. I expect them to blowout a mediocre Northwestern team in their biggest game of the season. Dwayne Haskins has been incredible all year with 41 passing touchdowns. If Ohio State keeps clicking like they did last week, they’ll win in a blowout. The outcome of this game depends on what Ohio State team shows up. Will the Ohio State team that blew out Michigan show up, or will the Ohio State who lost to Purdue by 29 show up in this contest. If Ohio State plays well defensively, which I expect them too, they can win this game handily. Ohio State shows up and shows why they deserve a playoff spot. The ACC has been a disappointing conference this season, with the exception of the Tigers. Clemson is stacked at every position and dominates on both sides of the ball. Cartersville alum Trevor Lawrence has been phenomenal and is taking the Clemson offense to new heights. He’s gotten a tremendous amount of help from sophomore running back Travis Etienne and a trio of talented receivers. 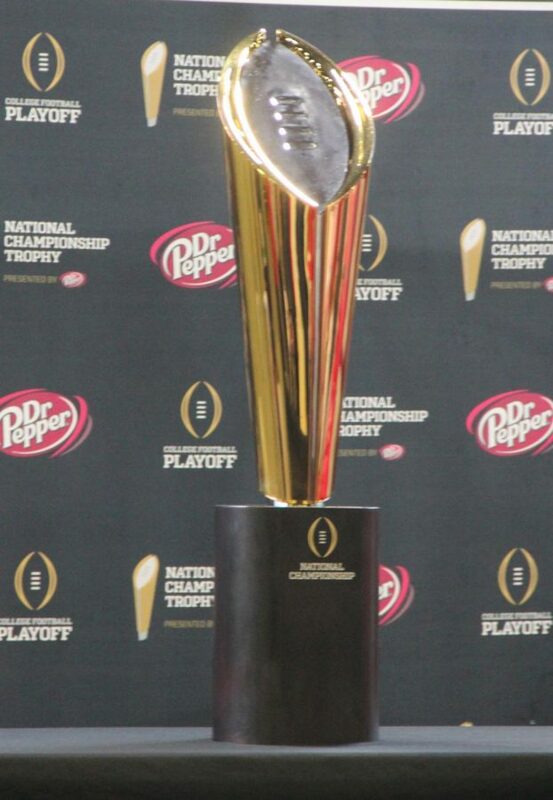 I don’t understand why the ACC doesn’t go ahead and give them the trophy. Pitt has no chance. The ACC is the worst conference in college football. It actually might be worse than the Sun Belt conference. Pitt is known for pulling off late season upsets, but I don’t see that happening this year. Clemson has been dominant the past few weeks and Pitt won’t stop them from cruising into the playoffs. The Dawgs are good, but not Alabama good. Heisman favorite Tua Tagovailoa has been spectacular this season, leading the Crimson Tide to an undefeated record. I think the Bulldogs can keep it close through the first half, but Alabama will pull it out in the second. Look for the Alabama defensive line, led by sophomore defensive tackle Quinnen Williams, to stop Georgia’s high powered running game. This is the best matchup this weekend and both teams have a chance to make the playoff win or lose. Georgia has found a lot of success in the run game after running back D’Andre Swift came back from injury. Swift has rushed for 100 yards in 4 out of their last 5 games. The Bulldogs’ ability to have a lot of success running and passing the ball is a huge reason they’ve been successful this season. I think Alabama will be able to contain Swift and keep him under 90 yards rushing. In the case that Georgia struggles running the ball, I don’t think the Georgia coaching staff trusts their quarterback, Jake Fromm, to win the game himself. At times this season Georgia’s offensive coordinator hasn’t put the ball in Fromm’s hands when he needs too. It may be a long day for the Bulldogs if they can’t run the ball consistently on Saturday.